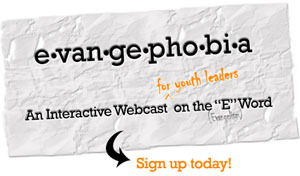 Register for Dare 2 Share’s FREE “evangephobia” webinar! The people at Dare 2 Share Ministries tipped me off about a free evangelism training seminar they’re doing online for youth leaders on May 17th. They’re going to stream a live video feed of Greg Stier going over evangelism principles, but the part I’m most excited about is the opportunity to interact, ask questions, and even discuss the questions Greg will pose to us. It doesn’t sound like it will be a, “Sit and take notes while you listen to me talk for an hour,” kind of thing as much as it sounds like a time for us all to discuss together some of the content Greg will present. Evangelism. For many, this word conjures up images of a street-corner preacher or a madman using a bullhorn and thumping people on the head with a Bible. But are those the only options? Join Greg Stier, President of Dare 2 Share Ministries for a lively, interactive webcast about sharing our faith and its role in youth ministry. You and other youth leaders will explore some of the most common fears surrounding evangelism, learn how it can help accelerate spiritual growth in your teenagers, and discover simple steps you can take to make it fit within your current youth ministry. Are you or your kids an “evangephobic?” Want your students to evangelize, but scared away by the extreme guts it often requires? Join Greg Stier and Dare 2 Share for a live, interactive webcast on May 17th to learn more about how to handle those fears. Don’t miss Dare2Share’s free Evangephobia webinar! I’m on the Dare 2 Share blogging team!